US, 2003, 93 minutes, Colour. The Agronomist is a striking documentary made by feature film director and Oscar winner, Jonathan Demme (Silence of the Lambs, Married to the Mob, Philadelphia, Beloved). Demme also made a number of documentaries, especially the musical concert, Stop Making Sense. He has strong experience to make this documentary both worthwhile as a document and to give it narrative dynamism. The film is a portrait of Haiti from the 20s to the beginning of the 21st century. It shows the extraordinary changes, socially and politically over that period, especially through the media. The focus is on Jean Dominique, who was a pioneer of film-making and of radio broadcasting in Haiti. The portrait is also of his wife Michelle Montas. Demme had met them when they were in exile in New York City in 1991, proposed a portrait documentary, continued to film Dominique over a period of ten years until his death in 2000. Demme was also able to get a great range of documentary footage from the past as well as more contemporary footage. 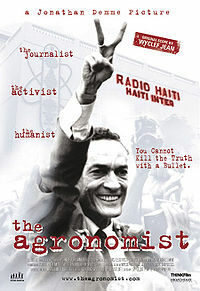 The film is exciting in its portrait of Dominique who was a very lively character with significant points of view on significant aspects of Haitian democracy, its successes and especially its failures, which led to danger for him, deaths of colleagues, attacks on his radio station, exile and ultimately his death. Jonathan Demme is self-effacing in this documentary (unlike the contemporary documentary about Fidel Castro made by Oliver Stone which almost stars Stone himself. It is exemplary documentary film-making, it is a most valuable document for the wide audience know and understand something of Haiti and it is, as Demme originally intended, a documentary portrait of Jean Dominique. 1. The impact of the documentary? Its strengths? The biography of Jean Dominique, a study of his personality and character, the politics of Haiti? 2. Jean Dominique and audience interest in him, Demme's interest in him, the possibility of his acting in film, Dominique turning it down, the strength of the interviews, personality, ideas? Jonathan Demme following through over the years with interviews and understanding of Dominique and Haiti? 3. The impact of his death in 2000, the politics of Haiti during the 20th century, the coups, terrorism, violence? 4. The style of the documentary, the interviews and their vitality, Michelle and Dominique's friends, family? Their testimonies? The historical film material, photos? Political history, television excerpts, news treatment? The locations? The editing and pace, the music, songs? 5. Jean Dominique as a Haitian, his identity, his contribution? His family background, mother and the more children, the reaction of the sisters, as a boy, his studies, going to Paris, agronomy and the 50s? His research? The suspicions of the government? 6. Radio Haiti, it being introduced by the physical attacks on the building, on the staff, the shootings? The flashbacks, the 1960s, Dominique and his film work and encouragement of directors, the film club and its being closed down? A cinema culture for Haiti? The radio and its success, his buying it, the staff, a free voice for the country? The samples of the broadcasts? 7. The history of Haiti, the background of the Napoleonic wars, the slaves' uprising? The 20th century and war, the presence of American troops? The Duvalier family? The Tonton Macoutes and the death squads, the violence, random? Executions? The tyranny of Duvalier, his international support? His death, the transition to his son, Baby Doc? The different era, the 80s, the media and the exposure of Baby Doc? Aristide and his opposition, the footage of his mass celebrations, sermons? The background of the voodoo celebration and party? The role of the Catholic Church, hierarchy, the Catholic Church radio and its assisting in the uprisings? 8. Haiti, the countryside, the economy, the poor, suffering, the revolutions, things seeming to get better and then worse? 9. The attacks on Radio Haiti, Dominique and his wife having to go to the United States, the years there, the decision for returning, starting the radio again, the next coup, their going into exile in New York yet again? Their being in communication with the Haitians, their influence? 10. The return in the 80s, Aristide and the possibilities, the coup and Aristide being overthrown? The president in exile, General Cedras and his rule? 11. The 90s, radio, the return of Dominique, his criticisms of Aristide and the interviews? The change of policy, the ethanol, the alcohol, profits for big companies and families? The build-up to Dominique's death? 12. The funeral, getting national honours, the tributes? The ashes and their being spread in the water? His wife's broadcast, talking as if he were still alive - and alive in the spirit of Haiti? 13. The achievement, of one person, his wife and her story, the interviews, the work in the radio station, the staff and their suffering, torture and death? 14. Haiti and politics, the Duvaliers, Aristide, Cedras, the subsequent governments? The inability to give stability to the country? 15. The context of Latin America and its troubles? 16. This kind of documentary as a way to inform the general public and keep alive the memory of a singular individual?